Activist, Permaculture promoter, and myth maker, Willi Paul, presented his Myth Lab, “Mythic Roundtable: Tools and Inspiration for Creating New Myths” on January 22, 2015 at the Granada Book Store, 1224 State St., Santa Barbara. Please see the results from this event at Planetshifter.com in early February. Question – I hear the word “myth” used more and more frequently. As a term is popularized, it becomes a victim of its own success. Even in Classical Greece, the term had multiple meanings. When you use the term “myth” please clarify what you mean by it and if that meaning is consistent throughout your work? 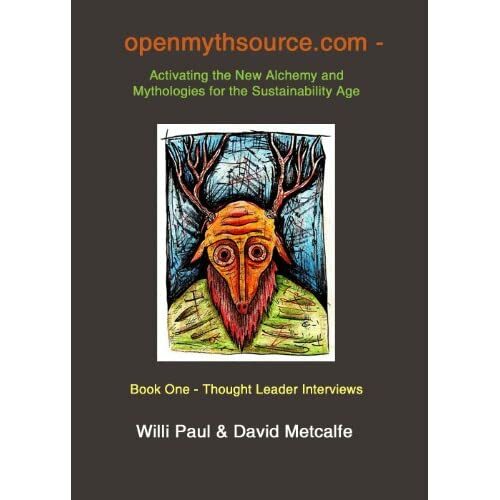 Willi Paul – Myth is a new, universal story that is generated by issues / crisis of our times like climate change, species extinction and drought. Classic myths support with general structures and motifs like hero, journey and initiation. 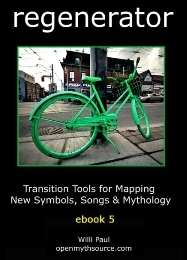 My myths deal with new community types like the permaculture and Transition movements. But my myth also includes bliss, an alchemic power to see past the hype and empower solutions. I believe that creative mythology, as described by Joe Campbell, is the right overall framework for individuals in these times. Question – The mythic motif of death and resurrection or rebirth is founded in agricultural/vegetative mythologies (e.g. Aphrodite/Adonis, Jesus the Christ, Ishtar/Tammuz, Inanna/Damuzi, etc). 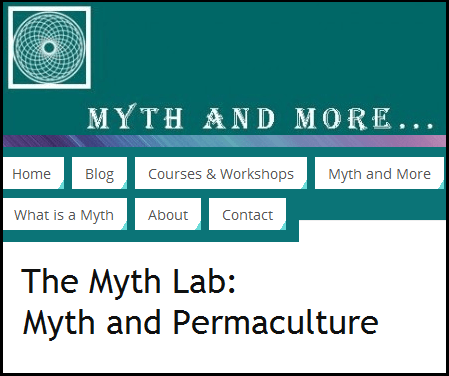 What mythic motifs, if any, are you seeing emerging from the permaculture phenomenon? C. Permaculture & Nature Archetype: A deep love for freedom to own fire arms; fear of guns and killing. Symbols: Rising coastal tides, melting polar ice, coal fired power plants. Question – I believe humans are hard-wired for story. There is much distress in some groups that Hollywood is dying. It is possible that form of storytelling is in decline, but I doubt if humans will ever be storyless. Please detail your experience in using story to explain, enlist, and engage in expanding permaculture awareness. Thank you Willi Paul for you input on this important issue. Your creative integration of myth making and permaculture promotion are truly inspiring. Margo Meck is a mythologist, writer, story consultant, and speaker. She received her Ph.D. in Mythological Studies from Pacifica Graduate Institute, Santa Barbara, CA. in 2007. She has lectured on various myth related subjects such as Personal Mythology, Proof of Identity in Myth and Fairy Tale, and the Hero’s Journey. This entry was posted in Alchemy, Campbell, localization, Myth Lab, New Myth and tagged death and resurrection, eBook #18, Five Methods to Design New Stories & Myths, Interview, myth generator, Mythandmore.com, Mythologist Margo Meck, newmythologist.com, openmythsource.com, Permaculture & Nature Archetype, planetshifter.com, SCORE: sounds symbols myths, Texting Joseph Campbell, The Myth Lab: Myth and Permaculture, Willi Paul, [ open myth source ]. Bookmark the permalink.